Demand for the United States Mint’s gold and silver bullion coins remained at elevated levels, although sales did back down from the near record amounts achieved in the prior month. During the month, the US Mint had six bullion coin options available. This included the 22 karat American Gold Eagle coins offered in one ounce, one-half ounce, one-quarter ounce, and one tenth ounce sizes. The fractional weight coins were first available to authorized purchasers on June 10, 2010. Other bullion coins included the one ounce 24 karat American Gold Buffalo coins and the one ounce American Silver Eagles. The table below summarizes the June 2010 sales figures for US Mint bullion coins. The first number column shows the total sales during the month, and the second column shows the total sales for the current year through June 30, 2010. This report includes bullion coin sales only, not numismatic products which are tracked separately in the US Mint Product Sales Reports. Total gold bullion sales for the month came in at 185,000 ounces. 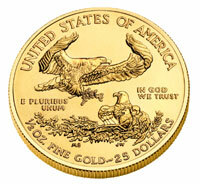 Sales of one ounce Gold Eagle and Gold Buffalo coins each dropped by more than half compared to the prior month. Some of the shortfall was made up by the newly released fractional weight Gold Eagles, which sold 31,000 one-half ounce coins, 44,000 one-quarter ounce coins, and 280,000 one-tenth ounce coins. Sales of this year’s one-tenth ounce coin already exceed the total achieved last year when the coins were briefly offered in December. The US Mint recorded sales of 3,001,000 of the one ounce Silver Eagle bullion coins. This represents the fourth month this year when sales have exceeded the 3 million level. For all of 2009, monthly sales had only exceeded this level on one occasion. Year to date silver bullion sales after six months have reached 18,168,500 ounces. If the current pace continues, annual sales would easily top the record sales of 28,766,500 achieved last year. The chance of cofiscation by the government of its own products is negligible. 3,001,000 ozt. silver bullion coins sold. 185,000 ozt. gold bullion coins (all types). For monetary purposes, the historic 16:1 ratio is implied!